Coriander is the oil of integrity, specifically personal integrity. Perhaps you’re stuck in a cycle of helping others while neglecting yourself and your own needs. You might have a strong need to serve others or to do what’s right. But the mind’s perspective of “right” can be very limiting and one-sided. Coriander will remind you that there’s always more than one way of doing something and that trying to fit in will eventually mean betraying your True Self. 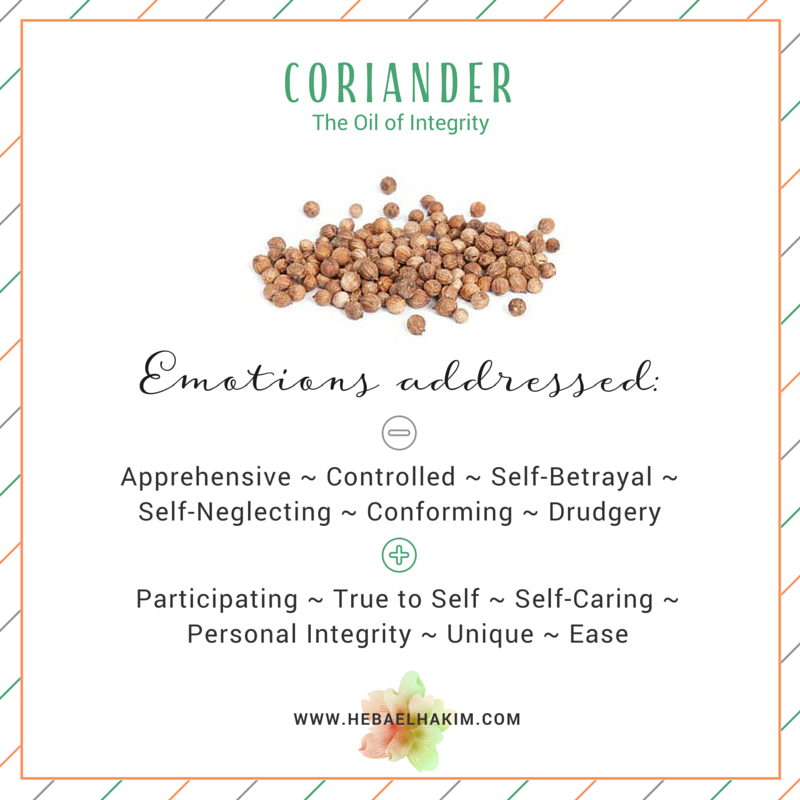 Coriander assists the individual in acting from a place of personal integrity which means doing things because you want to not because you have to or to gain others’ approval. Coriander offers you the chance (and perhaps risk for some) to be who you really are. It teaches that the individual is a gift to this world and everyone has something unique to offer that NO ONE else can offer it but that individual. Only we can be and express our own uniqueness and embrace it. That’s why I named by blog “Living Your Truth, Embracing You” – because I wanted to convey this message of living with personal integrity at all times. That means living in connection with what your soul urges and yearns for. Coriander shifts individuals from needing to be accepted by others to honouring and living from the True Self. This is a great oil for the heart chakra and interestingly this oil is good for overeating because overeating is a symptom of not taking care of your self in relation to food. Whether we overeat, have cravings for sugar or binge, it is all related to the matters of the heart. This is related to filling our void and our own self love. Coriander blends well with: Bergamot, Cinnamon, Clary Sage, Clove, Cypress, Ginger and Sandalwood. Depending on your uses for this oil, substitutes may include: Cilantro or Oregano. Always dilute and test for skin sensitivity prior to widespread use and use on the feet when possible. Excessive use of any oil can lead to skin sensitisation. Keep out of eyes, ears, or nose. Not all oils are created equal, so test brands carefully, and never use an oil in a way not recommended by its maker.